As one of the heaviest-promoted topics in the enterprise software industry over the last decade, the opportunities presented by social collaboration – both to potential adopters and vendors – has created a broad and confusing market for technologies that has at times been beset by over-inflated promises and hyperbole. Although there are many potential opportunities from leveraging social collaboration technologies to support a more collaborative organisation, it can be difficult to work out which vendor offerings are best suited to your needs. 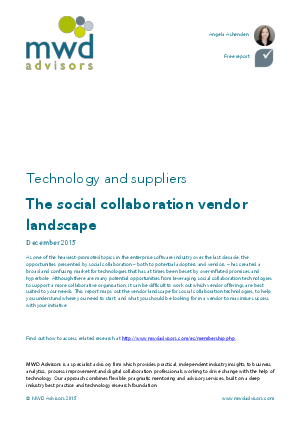 This report maps out the vendor landscape for social collaboration technologies, to help you understand where you need to start, and what you should be looking for in a vendor to maximize success with your initiative.